Do not use tire and wheel with different size and type from the one originally installed on your vehicle. It can affect the safety and performance of your vehicle, which could lead to steering failure or rollover causing serious injury. When replacing the tires, be sure to equip all four tires with the tire and wheel of the same size, type, tread, brand and load-carrying capacity. If you equip your vehicle with any tire/wheel combination not recommended by HYUNDAI for off-road driving, you should not use these tires for highway driving. Never start or run the engine while a full-time AWD vehicle is raised on a jack.The vehicle can slip or roll off of a jack causing serious injury or death to you or those nearby. AWD vehicles must be towed with a wheel lift and dollies or flatbed equipment with all the wheels off the ground. A full-time AWD vehicle must be tested on a special four wheel chassis dynamometer. 1.Check the tire pressures recommended for your vehicle. 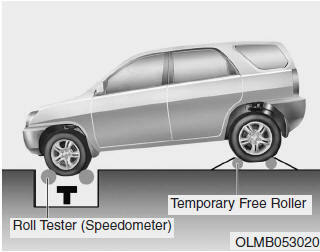 2.Place the front wheels on the roll tester for a speedometer test as shown in the illustration. 4.Place the rear wheels on the temporary free roller as shown in the illustration. Never engage the parking brake while performing the test. When the vehicle is lifted up, do not operate the front and rear wheel separately. All four wheels should be operated. Keep away from the front of the vehicle while the vehicle is in gear on the dynamometer. The vehicle can jump forward and cause serious injury or death.